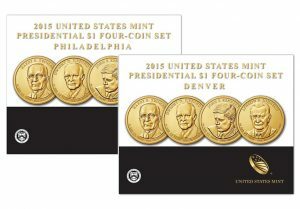 2015 P&D Presidential $1 Four-Coin Sets went on sale Oct. 22. Nearly 6,500 sold within the first few days. United States Mint products scored another strong round of weekly sales, the second in a row. Nearly 70% of the agency’s collectible coins and sets notched higher weekly totals. Gains were supported by a 28-page color catalog the U.S. Mint mailed to its customers. Two new products also helped. The U.S. Mint last week introduced its latest four-coin sets of Presidential dollars. The one with coins from Philadelphia opened at 3,378 and the one with coins from Denver debuted at 3,112. The starts are a bit higher than last year’s issues which opened at 3,352 for the Philadelphia set and 2,094 for the Denver set. The U.S. Mint published sales updates to 242 numismatic products. Overall, 164 of them outperformed their prior weekly sales compared to 110 previously. Fourteen of them increased by more than 1,000 units compared to 9 previously. Thirteen had their sales reduced compared to 12 previously. Below are tables showing the latest sales for U.S. Mint numismatic products. The sales period covers Oct. 19 to 25. Products with an asterisk (*) are no longer available.